DK-LOK® Toggle Valves are available for quick shutoff and sampling applications for analysis systems and test equipment. The spring loaded stem allow for a quick open and close. 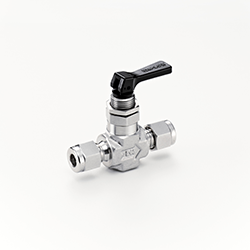 The 103 Series Toggle valves are available in a straight or angle pattern. Available materials are 316 stainless steel and brass as standard. End connections are DK-LOK® compression fitting ends, male and female NPT as standard as well. Panel mounting option is standard. The soft seat stem tip allows for repetitive leak tight sealing under positive pressure and vacuum conditions. DK-LOK® can easily meet your fitting and valve needs.